In some of my earlier posts, I made it a habit to provide links to similar projects, to which I was crafting. And with some of my newer tutorials I have been linking you to my pinterest boards. Since I started crafting I have bookmarked exactly 529 different craft tutorials from all over the web. Even some in foreign languages - which is why pictures are always so helpful. I've started to compile all the links I've been hoarding into one massive resource. I just started, and will continue to add at least a new category or update a few new things, every week, as best as I can. Feel free to link me to a tutorial you or someone else has made, which you would like to be added to a category. All the links can now be found under the new page in my sidebar called 'link love to amazing free craft tutorials'. 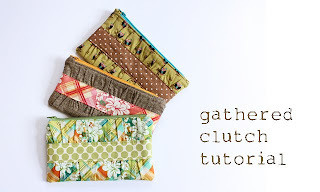 So far I have added five categories of tutorials - zip pouches, boxy pouches, wallets, clutches and ID wallets. You are very welcome. You have really really clear step-by step photos which I love in tutorials. Thanks for stopping by.